Garmin nuvi 865T features speech recognition, a 4.3-inch widescreen display, preloaded maps for UK, Eastern and Western Europe, 2D and 3D maps and includes a full 8-digit UK postcode search. The Garmin nuvi 865T also features a FM transmitter allowing you to hear audio, including voice prompts and MP3s, through your vehicle's stereo. Garmin nuvi 865T provides hands-free calling via the wireless Bluetooth module and using the integrated traffic receiver the Garmin nuvi 865T will provide alerts about traffic delays and roadwork's that lie ahead on your route. The Garmin nuvi 865T also provides access to speed camera locations. Garmin nuvi 865T has been discontinued. Accessories, spares and parts are still available for your nuvi 865T, as are road maps. Garmin nuvi 865T satellite navigation device with full speech recognition features a 4.3-inch TFT touch-screen LCD and features a full 8-digit UK postcode search with 2D and 3D moving maps of UK, Eastern and Western Europe. The Garmin nuvi 865T also features an FM transmitter, hands-free calling, traffic alerts and more. Like the rest of the wide Garmin nuvi 700-series, its premium navigation capabilities, like route planning and a handy locator, give you peace of mind on the go. Garmin nuvi 865T high-sensitivity internal (non flip-up) antenna gives it a sleeker, thinner design than the Garmin nuvi 600-series, making it easy to slip in your pocket or purse. Its rechargeable lithium-ion battery makes it convenient for navigation by car or on foot providing up to 5 hours operation. Keep track of yourself and your car with Garmin nuvi 865T. Just tap "Where Am I?" to find the closest hospitals, police stations, petrol stations, nearest address and junctions. Also see your exact latitude and longitude coordinates. The Garmin nuvi 865T even remembers where you parked. It automatically marks your position when you remove it from the windscreen mount, so you can navigate with the Garmin nuvi 865T on foot and find your way back to your vehicle. Perfect for unfamiliar spots and crowded places such as amusement parks, stadiums and shopping centre car parks. The Garmin nuvi 865T integrates Bluetooth wireless technology with a built-in microphone and speaker for hands-free calling. Just pair the Garmin nuvi 865T with your compatible Bluetooth phone and talk hands-free through the nuvi 865T while staying focused on the road. Simply dial numbers with Garmin nuvi's 865T touch screen keypad to make a call. To answer calls, just tap the screen and speak directly into its built-in microphone. With the Garmin nuvi 865T's integrated FM TMC traffic receiver. Receive alerts about traffic delays and roadwork's that lie ahead on your route. Next, simply touch the Garmin nuvi 865T screen to view traffic details or detour around the problem area. Navigation is just the beginning. The Garmin nuvi 865T includes many “must have” entertainment and travel tools including MP3 player, audio book player (subscription to Audible.com required), JPEG picture viewer, currency converters and more. With the Garmin nuvi 865T's wireless FM transmitter you can hear audio, including voice prompts, MP3s and audio books, through your vehicle's stereo. The Garmin nuvi 865T, like all Garmin sat nav's, gets its speed camera data from the Cyclops speed camera database. The database provides advanced alerts to fixed, average speed, mobile, variable, temporary roadwork, red light and red light speed cameras. As you approach a camera, your device sounds an alert. Subscription charges apply. Click here to read more about the Cyclops speed trap database. Do you have a question about the Garmin nuvi 865t that's not been answered on this webpage? Please see our car sat nav FAQs for questions from other customers and visitors. Plus if the answer to your question isn't featured, use the online form to ask us for the answer. Alternatively please telephone 01733 777623 Monday to Friday (9:30am-5:00pm) to speak to one of our sales team. Garmin nuvi 865T has been designed to be plug and play, and as such can be transferred from vehicle to vehicle with ease. The Garmin nuvi 865T is powered via the supplied vehicle power cable which includes an integrated GTM 21 FM traffic receiver for real-time traffic updates. The Garmin nuvi 865T then attaches to your vehicles windscreen via the Garmin nuvi 865T suction cup mount. Alternatively using the supplied dashboard disk you can mount the suction cup mount on top of your dashboard instead. The Garmin nuvi 865T also includes carry case for storage of the Garmin nuvi 865T when not in use. The Garmin nuvi 865T is preloaded with City Navigator® NT for United Kingdom, Eastern and Western Europe provided by NAVTEQ. NAVTEQ maps provide high quality detailed street level maps, which in addition to street information include features such as route calculation, Points of Interest (POI), Estimated Time of Arrival, and more. Further Garmin nuvi 865T maps are available SD card which insert directly into the Garmin nuvi 865T. Available Garmin nuvi 865T maps include North America. 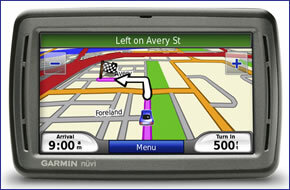 View the complete range of maps available for the Garmin nuvi 865T. Looking for accessories and spares for the Garmin nuvi 865t? All parts are genuine Garmin product and specifically designed for use with the nuvi 865t. Accessories available to purchase include vehicle power charger, mains AC charger, a weighted dashboard mount and mini USB cable. Looking for sat nav maps for the Garmin nuvi 865t? All mapping comes on microSD card with SD card adaptor and is genuine Garmin product and specifically designed for use with the nuvi 865t Countries available to buy include: UK and Ireland, France and Benelux, Full Europe, North America, Australia and New Zealand.